The historic Montefiore Institute is a gift from The Little Synagogue on the Prairie Project Society to the Calgary Jewish Community and to Calgary's Heritage Park Historical Village. This original 1916 prairie synagogue, which once served a tiny Jewish bloc settlement in eastern Alberta, is the first synagogue to be included in the permanent collection of any historic park in Canada. In 2005, Irena Karshenbaum began to gather volunteers and write a proposal to Calgary's Heritage Park Historical Village for the inclusion of a synagogue in the park's permanent collection. The Little Synagogue on the Prairie Project was soon born and grew to include dozens of volunteers who gave selflessly of themselves to gift the historic Montefiore Institute - The Little Synagogue on the Prairie - to Heritage Park. On June 28, 2009, the fully restored Montefiore Institute was opened to the public with great joy and fanfare from the over 2,000 people in attendance. The Little Synagogue on the Prairie Project Society, the not-for-profit society registered in Alberta, Canada, has completed its mission and The Montefiore Institute is now the property of Heritage Park. 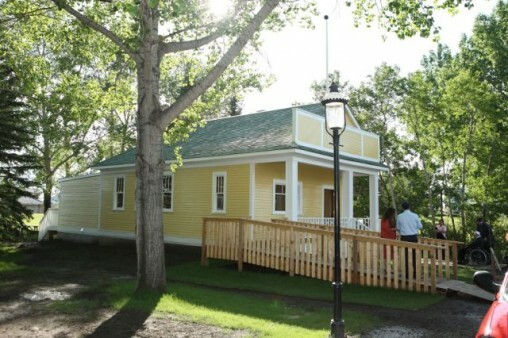 To restore and interpret a 1916 historic prairie synagogue building at Calgary’s Heritage Park Historical Village for the education and enjoyment of the park’s visitors, in order to build bridges of understanding among people of all cultures and religions. - To encourage and support the building and appropriate furnishing of a restored prairie synagogue at Calgary’s Heritage Park Historical Village. - To secure funding from various sources including government, corporate, private, community and foundations to build and support the operation, maintenance and interpretation of the prairie synagogue. - To develop educational programs to interpret the synagogue, its history and context. - To assist with the training and education of Heritage Park staff and volunteers who will work as interpreters in the prairie synagogue. - To produce educational materials, brochures and/or other publications about Jewish life on the Canadian prairies from the 1880s to the present time to put this building in the context of that history. - To build relationships and goodwill between the Jewish community and Heritage Park’s board, staff, volunteers and visitors through the mechanism of the prairie synagogue. Born in 1922 on his father's homestead in Eyre, Saskatchewan, David Zukerman z"l moved to the Montefiore Colony at Sibbald, Alberta in 1927. The Zukerman family farmed in the bloc settlement until 1951. David lived in Calgary and passed away on February 18, 2011.